A layered bake. 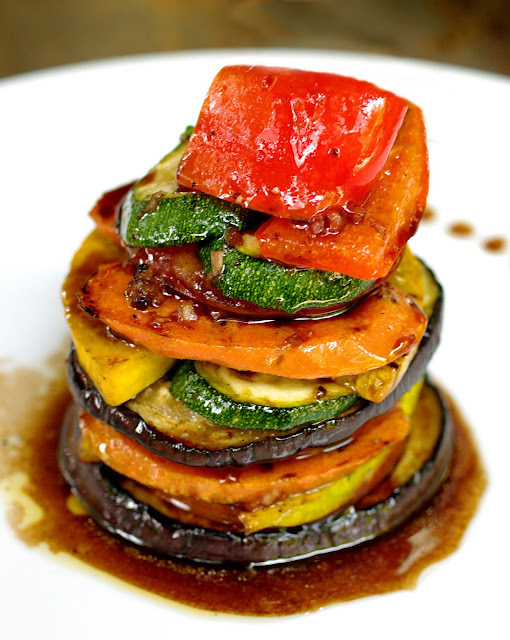 A tower of vegetables, all roasted until sweet and yielding, with a dressing of cheese, herbs and my sweet, sour and smokey sauce. Let's agree not to call it a 'mille feuille'; there's really no need, least of all because this is at least 994 leaves short. Also auto-correct hates the term and keeps wanting me to write about a 'mild refill', and this is definitely not that. Apologies for my prose on this one. I am in the middle of the most intense job of my career and, right now, I feel like I've run out of words. I spent at least ten minutes this afternoon searching for the term 'eccentric'. I think, for the first time in my life, I might be tired. I often serve this as part of a split menu when the carnivores are having lamb or beef. It's a robust full flavoured dish and so works with traditional accompaniments to roast meats. More a technique or a theme than an actual recipe, you can use any veg that will roast well. It's infinitely variable* but I especially like the colour combination of red and yellow peppers, tomato and butternut squash but you can also use cauliflower, aubergine, carrots, courgette or even portobello mushrooms. A large one serves as an entire course on its own. Smaller ones serve in place of meat as part of a meal. You can build a stack as in the pic above but I also like cutting circles out of the veg for a neater look. I also find that trying to stack very hot veg to be both tricky and burny for more than two people. No one wants their mille feuille, froid do they? So I assemble part baked veg and then finish in the oven once guests are assembled. If you are also serving roast meat these can sit in the already hot oven while the meat rests under foil. Carrots: 30 minutes - why does carrot take so long to cook? Aubergine: 15 minutes - go easy on the oil there. Mushroom: 5 minutes - Just oil the tops. There's no need to roast the tomatoes just yet. This is just a guide. Basically you should be able to make an indentation with your finger (careful). You might also like your veg harder or softer than me. Aubergine, especially, is a matter of personal taste. The easiest way to do this is add the longest roasting slices first, then the others in reverse order. The important thing is that all the layers are in the same state of 'cooked' so, ready for the final bake. The mushrooms, peppers, courgette and aubergine can alternatively be griddled. This gives you attractive and tasty char lines. If you don't have a griddle, try a skewer, held over a hob flame. Bit of a faff though. Once roasted, either stack up the slices in bags and refrigerate until needed or assemble straight away. Roast veg slices make a handy side dish anyway. Great with meat or fish. Before guests arrive make your stacks. Again line the roasting tray with oiled paper. Oven to 200°C. I like to season each layer with just a little salt, pepper and a pinch of freshly crushed coriander seed. Note: I don't mean use powdered coriander here. Just cracked seeds smell fantastic and add some texture. Go as high as you dare, or you think appetites will manage. Top with some cheese - I like salty feta crumbled but soft goats works well too. Mozzarella will give you mouth feel but little flavour. Personally I think this is no place for cheddar but feel free to shout me down. Bake for about 12 minutes, until the cheese is looking interesting. Remove to plates using a spatula and a steady hand. Serve on a display of spinach leaves. Pour over the dressing and garnish with lots of aromatic herbs. Often dill or very finely chopped rosemary. The dressing makes the dish here but for an easy meal you could just slum it with oil and balsamic. If you substitute redcurrant jelly for the honey (and obviously omit the cheese) the dish is vegan. You won't find the vinegar I use in the shops but please seek it out. I've linked to my on-line provider. I've said quite enough about L'Olivier vinegars in another place and won't bore you all here again. New River Dining glaze for roasted veg. 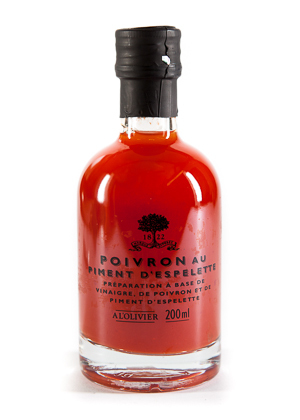 In a glass, mix a tablespoon of oil with one of red pepper vinegar. Add a half tablespoon of honey. Add a big squeeze of lemon or lime juice. Fish out any pips if using lemon. Whisk with a fork. Taste and adjust. Add a knife tip of smoked paprika, less of cayenne, a good pinch of sea salt, black pepper and at least a half teaspoon of ground coriander. Taste again. Add more of everything probably, until something tingles. The flavour should be intense. Remember that this will be spread thin. Toss in some robust chopped herbs, maybe chives or lemon thyme. Pour over your roast veg. *So not infinite. I think it would be the factorial of n, where n = (let's say) three cheeses and eight vegetables = factorial of 11 = 39,916,800. Eaten once a day that would take you over 1300 lifetimes to work through all the combinations, by which time you and the many generation of your family after you, burdened with your gastro-pedantry, would be utterly sick of it. Would really appreciate it if a mathematician could correct my errors here.